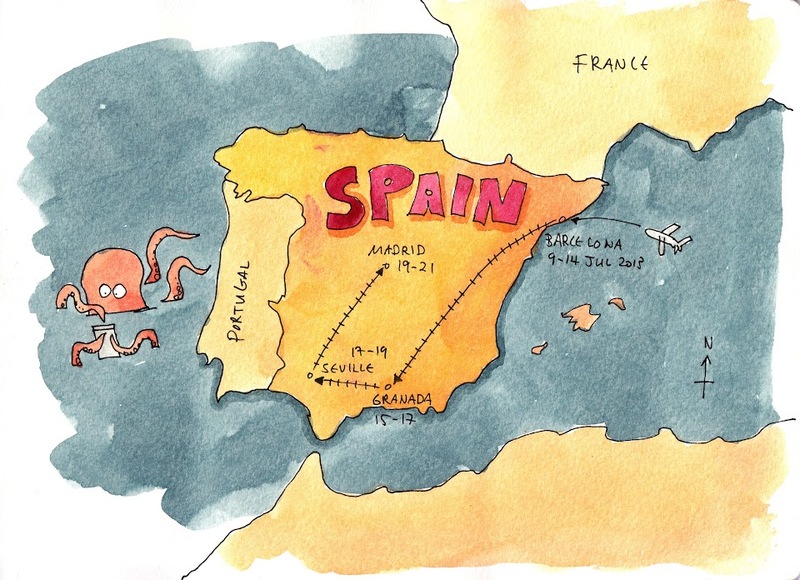 On 9-21 July 2013, I traveled to Spain for a sketching trip. 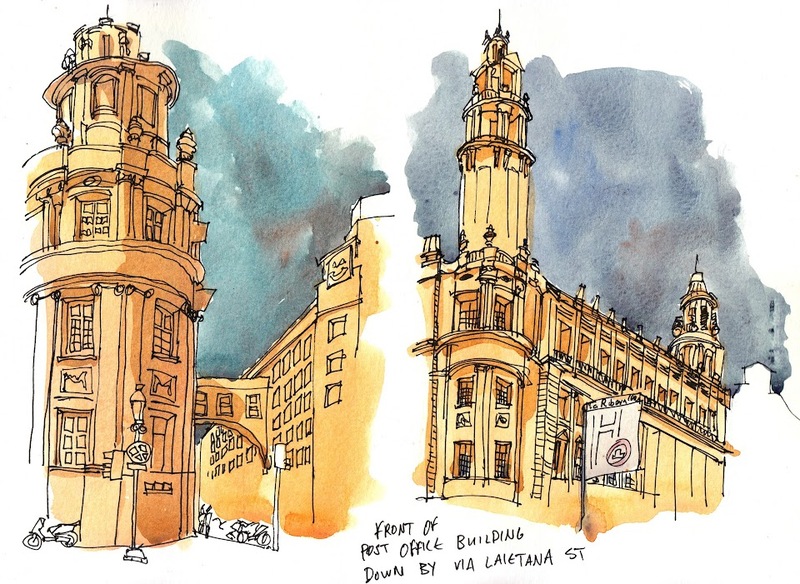 I was there for the several sketchcrawls held in Barcelona while the Urban Sketchers Symposium was going on. I did not sign up for the Symposium which on hindsight is a good choice because there's just more time to sketch when you're not in the workshops. 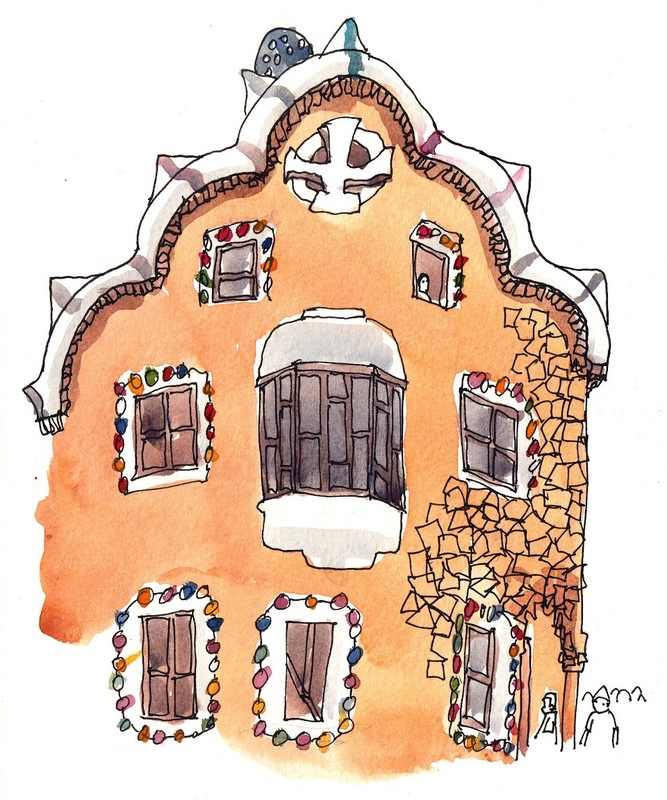 Six days in Barcelona is certainly not enough for a sketcher. This is my most intense sketching trip so far, mainly because I spent more days than the previous trips. I spent 13 days as compared to less than a week each for Penang and Bangkok. Places I visited include Barcelona, Granada, Seville and Madrid, in that order. You need more than two weeks to cover those places, especially when you include Barcelona and Madrid. 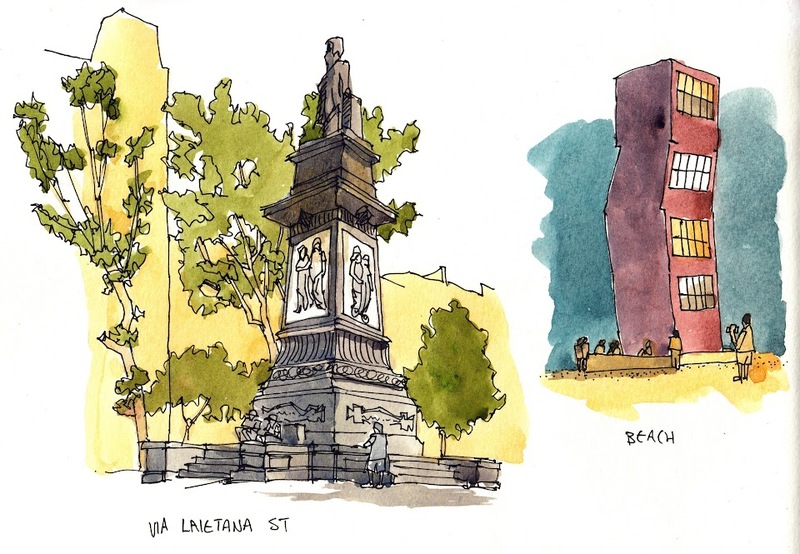 Drawing on trips is more rewarding that taking photographs. You'll remember the places and people more vividly. Sketching is a nice way to slow down and soak in the experience. With the camera, sometimes I can't even remember if I've taken a particular shot minutes ago. When you're rushing from place to place, taking hundreds of photos, everything seems like a fleeting memory. For me, there's always a disconnect when I look back at photos taken compared to those I've drawn. My first sketch in Barcelona is the back of Barcelona Cathedral. I was drawing at this location with Omar Jaramillo and Paul Wang. Drawing any tall building from close distance is always a challenge. Nearby, a musician was playing music, and tourists were swarming the place. I saw a few tour guides pointing and talking about specific bricks on the wall. The original sketch was in black and white. I coloured it later back at the room. This is the only vertical format sketch during the trip. Draw too many of these and I might break my neck. This is the front of Barcelona Cathedral. I was there this time with Liz Steel and Marc Taro Holmes. We were talking about how to make our blogs more popular and sell stuff. Marc Holmes draws for games, books and films. I left part of the cathedral in white space because I made a mistake with the window sizes on that side. It's better to leave it as it is than to introduce more mistakes. On the left is a little cafe near Sagrada Familia where I had my breakfast. The waiter took a photo of the sketch. 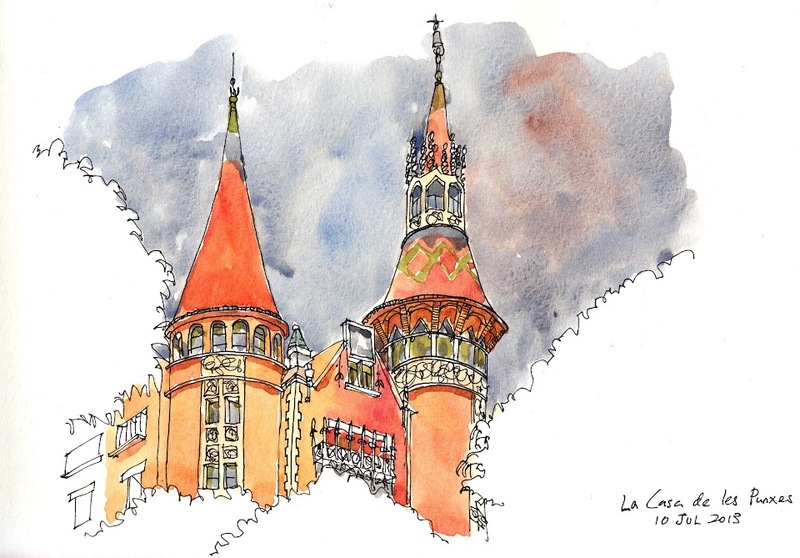 There was a sketchcrawl that day starting at Hospital Sant Pau but I only found out after buying the Sagrada Familia tickets for the morning. 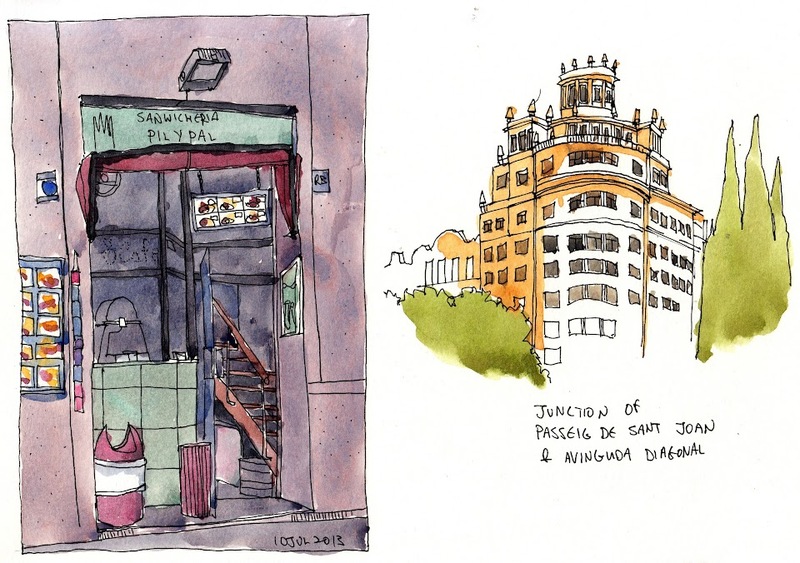 The right sketch was drawn later that day at the other sketchcrawl location, junction of Sant Joan & Avinguda Diagonal. The building I wanted to draw initially was one with a huge advertising display of an owl but there wasn't a good spot to put my chair. You can see the owl on Google Street view. 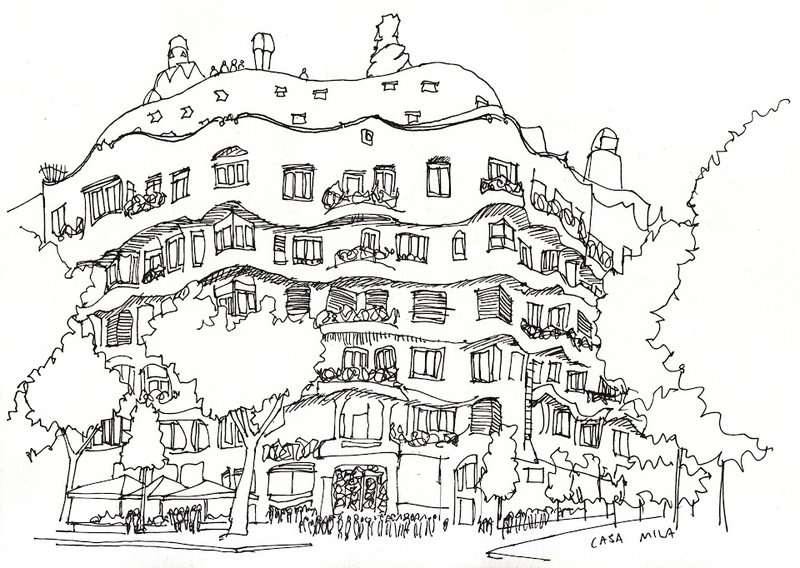 I was drawing La Casa De Les Punxes with other sketchers including Gerard Michel and his nephew Fabian. I love the roofs. Many buildings in Barcelona have intricate designs for their roofs. Some had large statues sitting on them. Those are pretty cool too. Sagrada Familia is in the background. 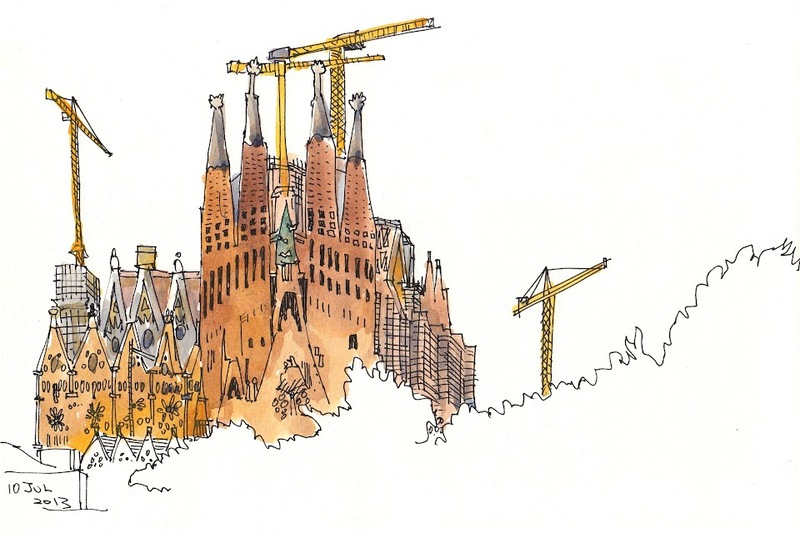 I wanted to have the playground juxtaposed against the incredible architecture of Antoni Gaudi. Many of the double page spreads took me around 2-3 hours just for line work. I start with pencils for proportions and finish in ink. My strategy was to draw with just ink and then colour back at the room. But by the end of the day, I was too tired to colour anything. Even right now at home, it seems daunting to finish the ink drawings with colour. While drawing this piece, I was wondering why other sketchers hadn't appear yet. Turns out they were are the Nativity Facade side of Sagrada Familia. The side I was drawing is the Passion Facade, or the side where the main entrance and ticket booth are. Book your tickets online for this place because the ticket queue circles the premise. The waiting time is at least an hour or two. The sketchers were drawing the Passion Facade from behind the large pond across the street. The details on the facade is astonishing. There's so much going on it's quite impossible to describe except to say that you have to see it in real life for yourself. The building commence in 1882 and it's still under construction today. I went inside too and went up the towers. It's feels like visiting one of those castles from video games with its many passages and hidden rooms and corners, except this one's in real life. Other sketchers during the sketchcrawls. A beautiful building with carpet vine covering the sides up to five floors. Casa Milà, another famous building designed by Gaudi. I had to rush this piece due to a drizzle. Luckily I had almost finished. I didn't enter the building or go up and see the whimsical chimney designs. As I was drawing this, a mum was reprimanding her daughter for almost getting knocked down by huge bus. This also happens to be one of the tour guide stops. Provenca Metro station. 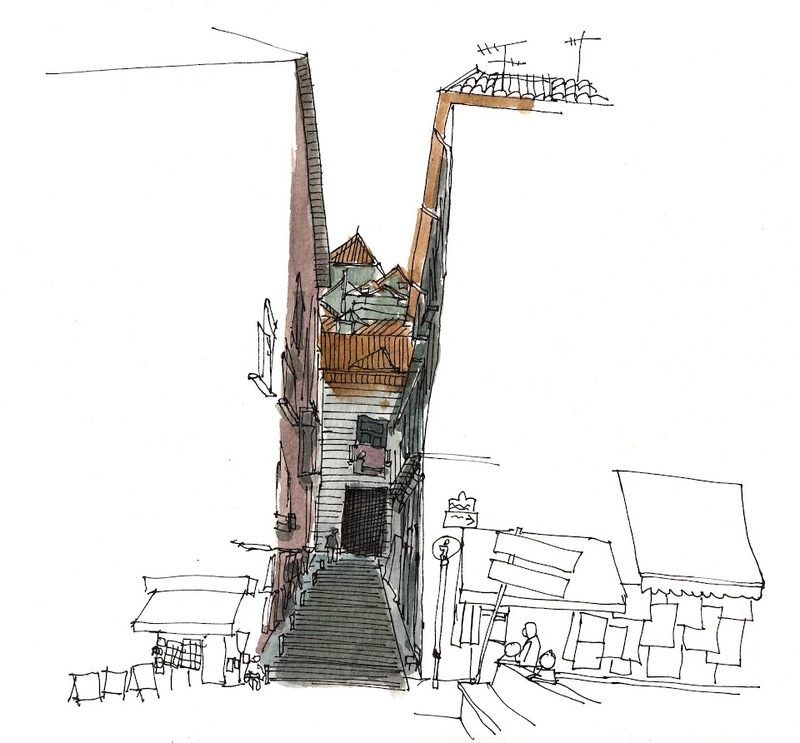 I finished only three quarters on location and drew the rest of the right side from photograph. The trains were coming so frequently I was spending unnecessary time waiting for an unobstructed view. They were installing some sort of barrier at the far section of the opposite platform. 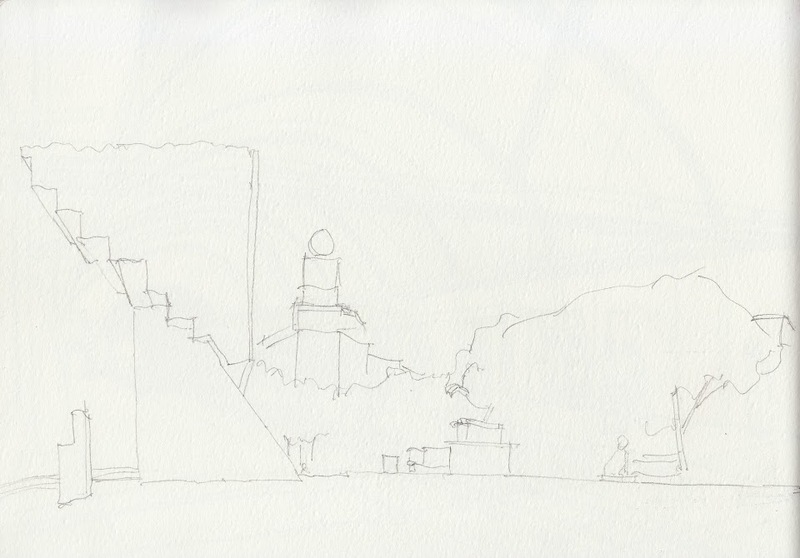 An unfinished sketch of Catalunya Plaza. It's around the evening time which is 7pm and still bright enough for a two hour sketch that did not happen because it started to drizzle. 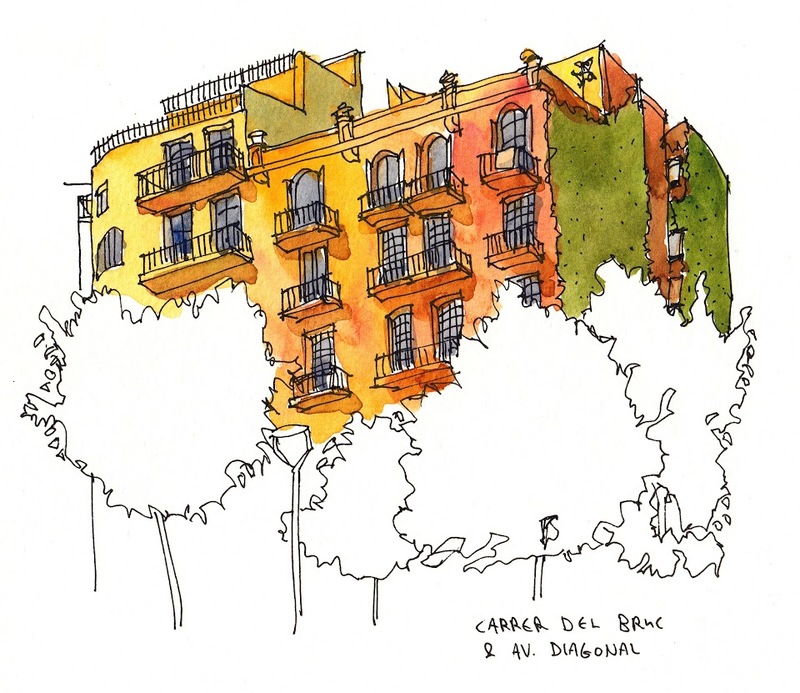 I'm glad my accommodation, booked through Airbnb, is near Catalunya Plaza and I could go back after dinner after the unsuccessful sketch. I went to the wrong meeting place, again, for the sketchcrawl. 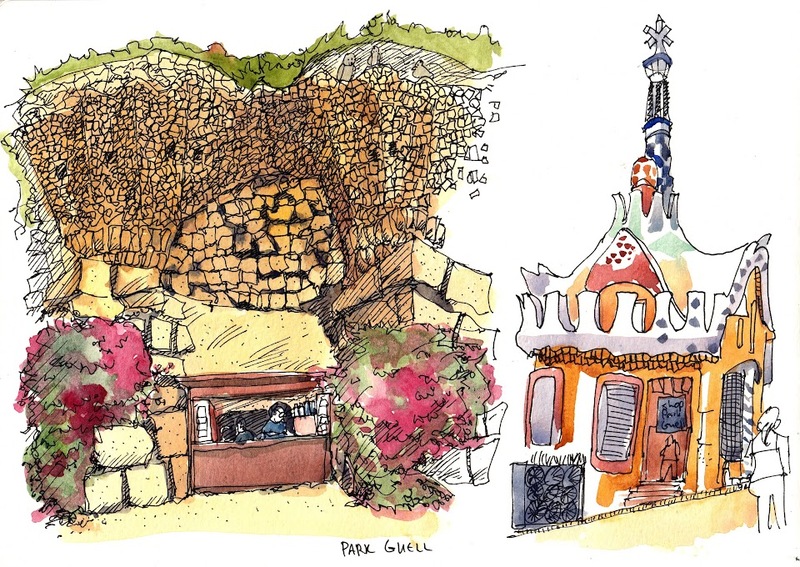 The left sketch was drawn at Park Guell Terrace while the meeting point is actually below. Visit Park Guell early in the morning because there will be less tourists, especially so if you want to take photos with the mosaic salamander on the stairs below. 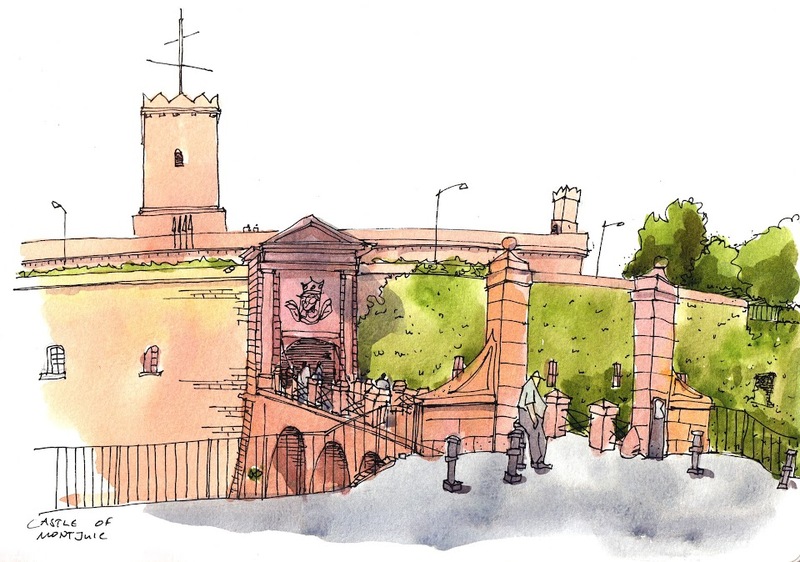 Sketch on the right is one of the two buildings at the entrance. Reminds me of Hansel and Gretel and their house made of sweets. Park Güell was also designed by Gaudi. This is the other building beside the one above. So I managed to find the correct meeting point this time, after spending two hours at the top. This view was from the front of the stairs. If I were to draw all the tourists in, you won't see Park Guell. That's how crowded it was that day. These two are from the Eixample area of Barcelona. On the left is the Church of the Holy Conception where I waited for the rain to stop. 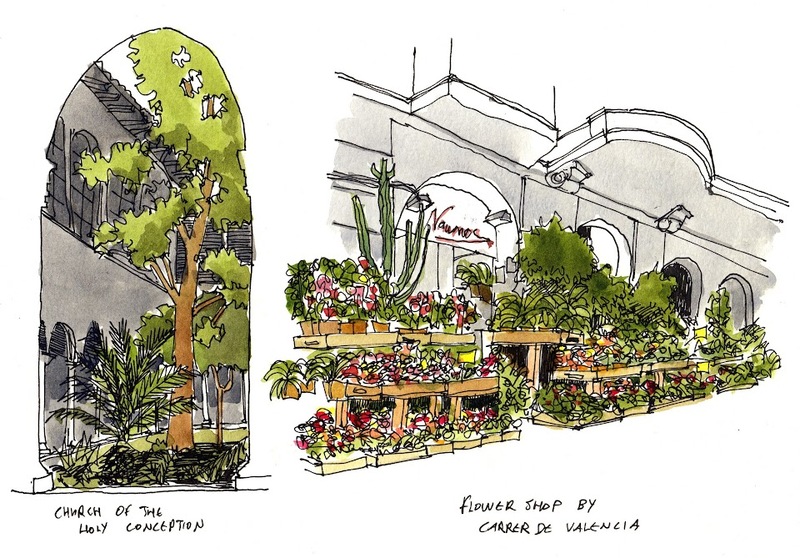 The right is a huge flower shop by Carrer De Valencia. There are a few flower shops along this street. In Singapore, our flower shops are small compared to that one I saw. 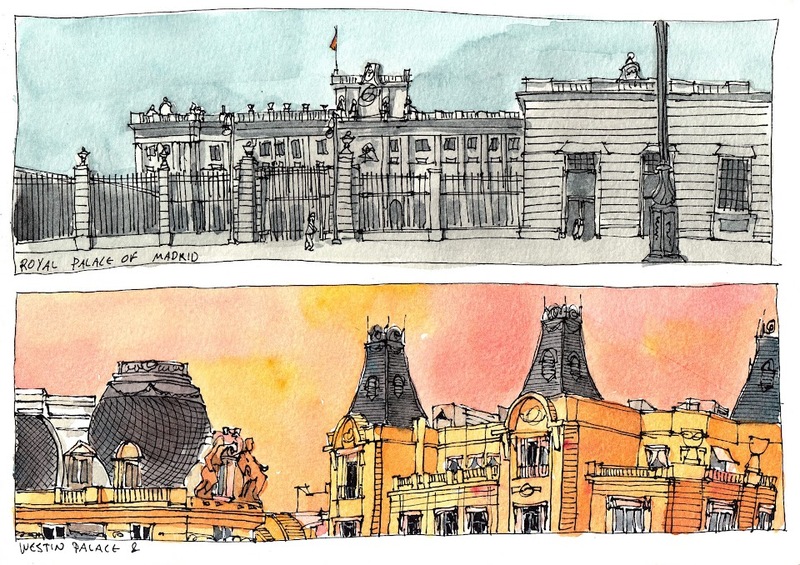 The back and front of the post office down by Via Laietana Street, another sketchcrawl location for the day. This is also quite close to the post office's entrance, across the street. Those are sketchers hiding in the shade drawing the post office. 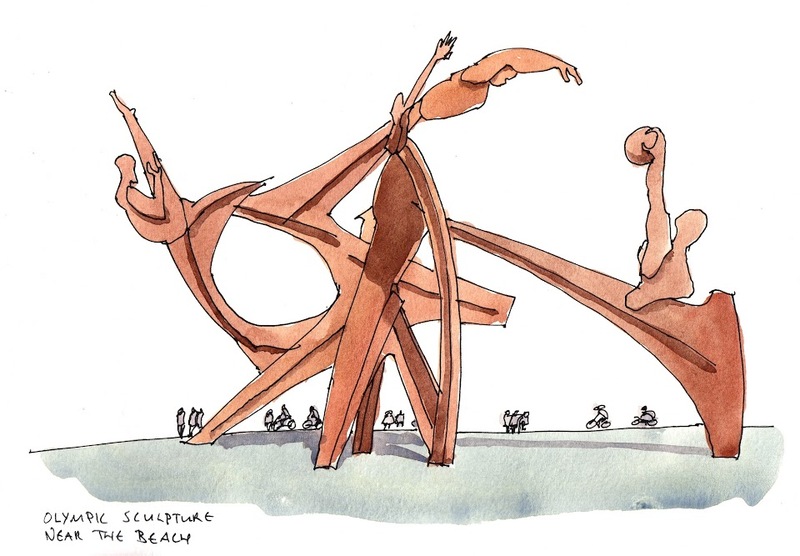 The sketch on the right is some wacky sculpture at the beach. 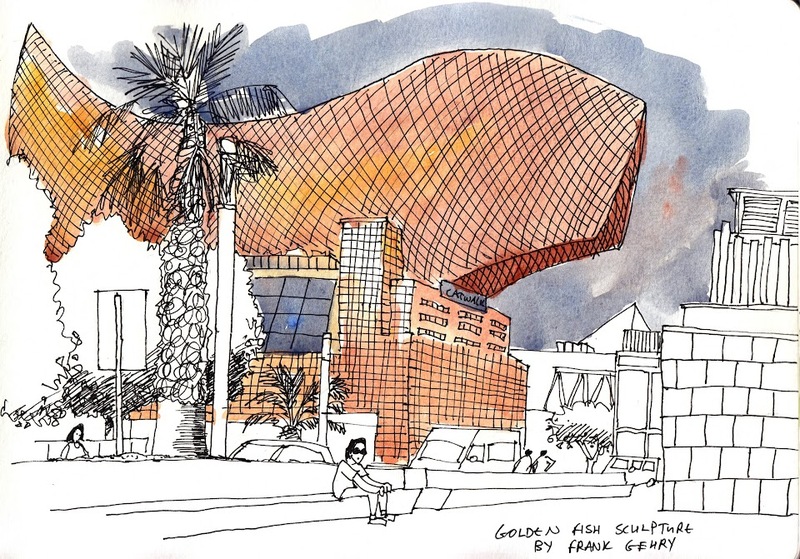 Walking to Port Olimpic, you'll see a huge fish sculpture by Frank Gehry. It's almost gold in colour while the sun sets. I did not convey that too well in this sketch. It's a demo piece for my lovely student Carole Tompers from Luxembourg who's here to accompany her sketching friend Beliza. One of the few panoramic pieces I coloured on the spot. 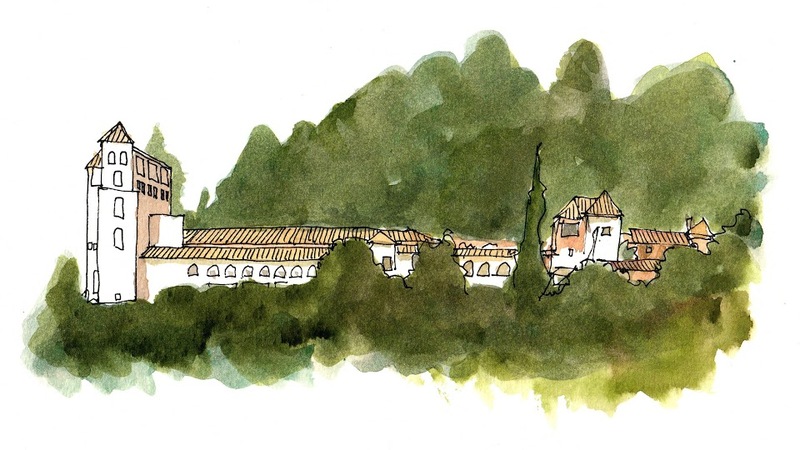 This was drawn at the front of the Parish of San Miquel Del Port. It's challenging getting the perspective of buildings at the edge of the paper. 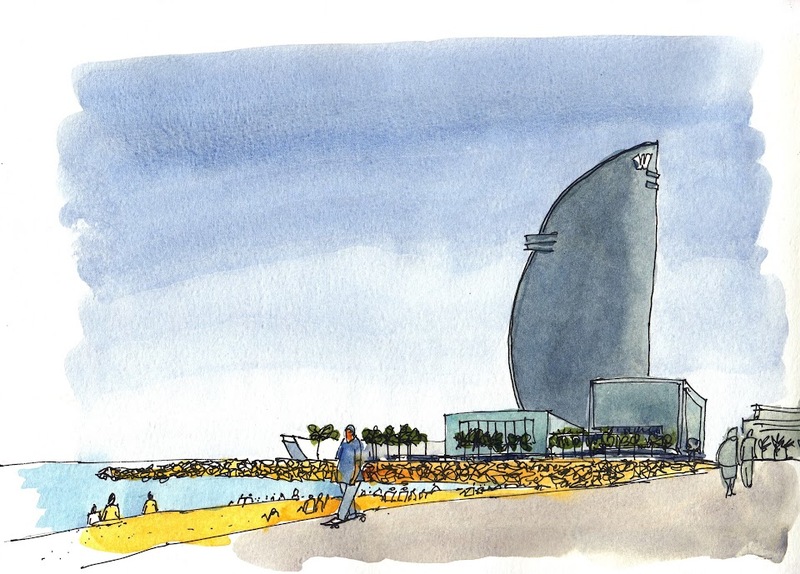 W Hotel Barcelona as seen from the crowded beach. The Olympic sculpture, also at the beach. 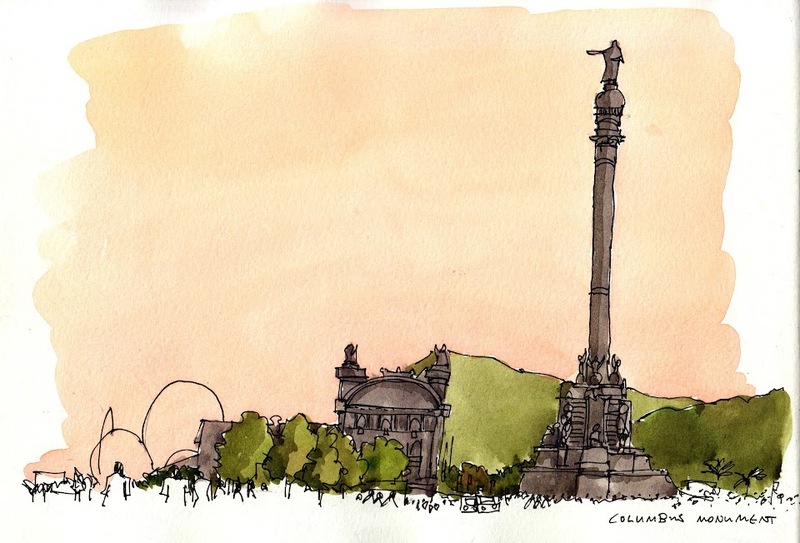 The Columbus monument at the end of La Rambla. Those squiggly lines are the bottom are the crowd of evening tourists. It was getting late so I rushed the three pieces above with less detail. I drew 8 pages that day. Castle Montjuic, or what is left of it. I won't say it's very majestic because design is rather minimalist. The city view from top of Montjuic. I've never drawn buildings in the distant before but I knew I wanted to draw at least one cityscape view. 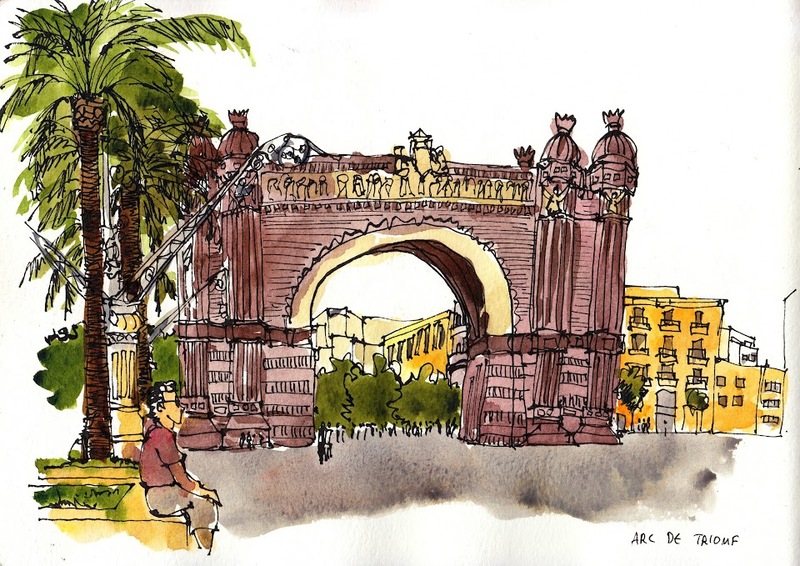 Arc De Triomf is the location for the final sketchcrawl, including those from the symposium. There must have been more than three hundred sketchers that day. This is one of two pieces that I drew with the Hero pen. I was drawing with the two Pilot Techpoint pens that I refilled and they were running low on ink. The lines look very different compared to the other sketches. 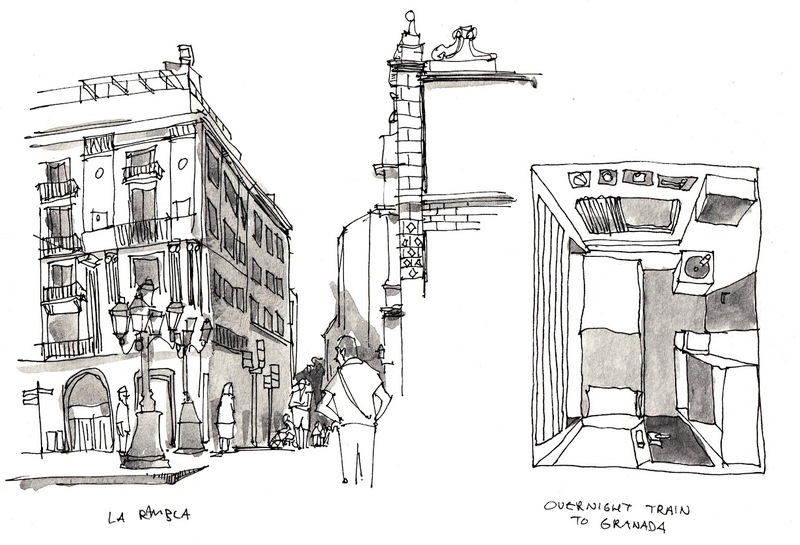 I had wanted to draw many of the narrow streets seen from La Rambla but just didn't have to the time. Lovely street lamps, as are many of those I've seen. The right is the cabin of the Renfe overnight train to Granada from Barcelona. Some houses on the hill in Granada. Too bad I only had time to finish this much. Colour was added much later. I like how the sunlight hits the building and create the sharp shadows. This was drawn inside Alhambra. I almost fell asleep drawing the sketch on the left. Too tired and the courtyard was too inviting for an afternoon nap. Alhambra as seen from the hilltop where those white houses were earlier. Plaza Nueva in Granada which is near my hotel. It must be around 40 degrees at the time. I was seated in deep shade and there was a water fountain in front so I'm pretty safe from the heat. 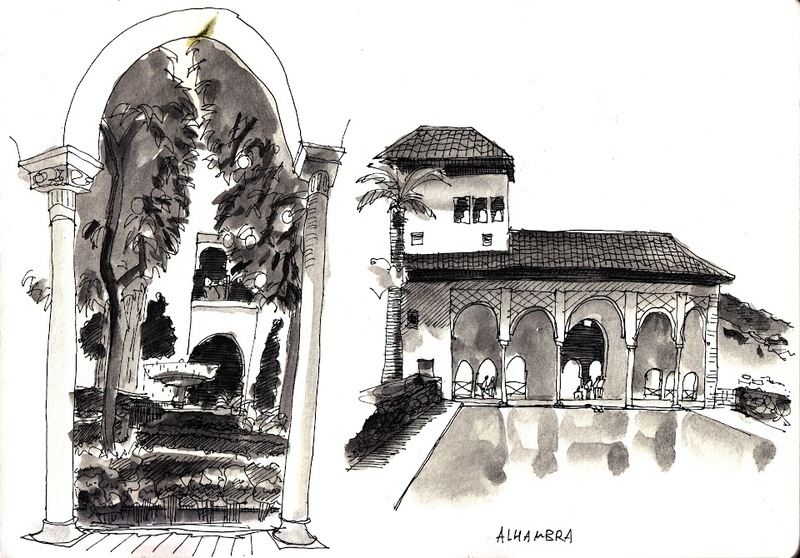 Palacio de Generalife is one of the outlying buildings connected to the Alhambra. There are several huge gardens in the palace. The whole of Alhambra is huge and can easily take up more than half a day to explore. One of the many narrow streets leading up to the small hill opposite Alhambra. Most of the cathedrals I've seen so far are huge. Granada Cathedral is no different. If you look closely at the bottom right, you can see a guy dressed as the grim reaper waiting for tourists to take picture with him. 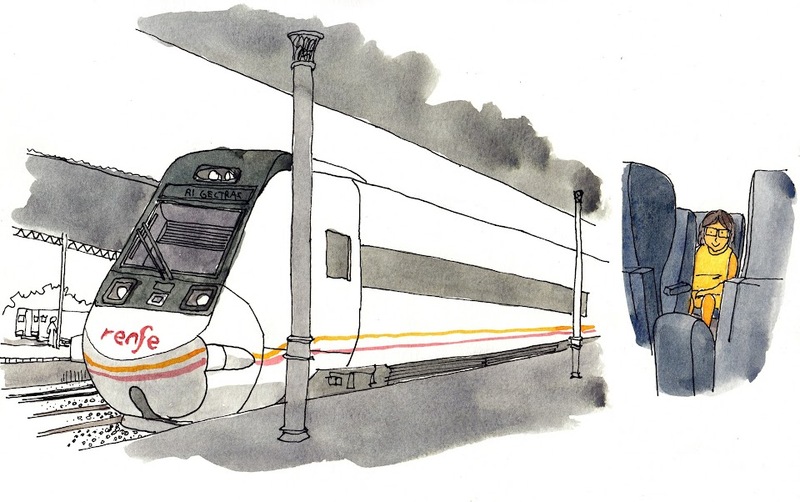 Another high speed train, this time from Granda to Seville. I saw a lady wearing a dress with a really beautiful shade of olive yellow. 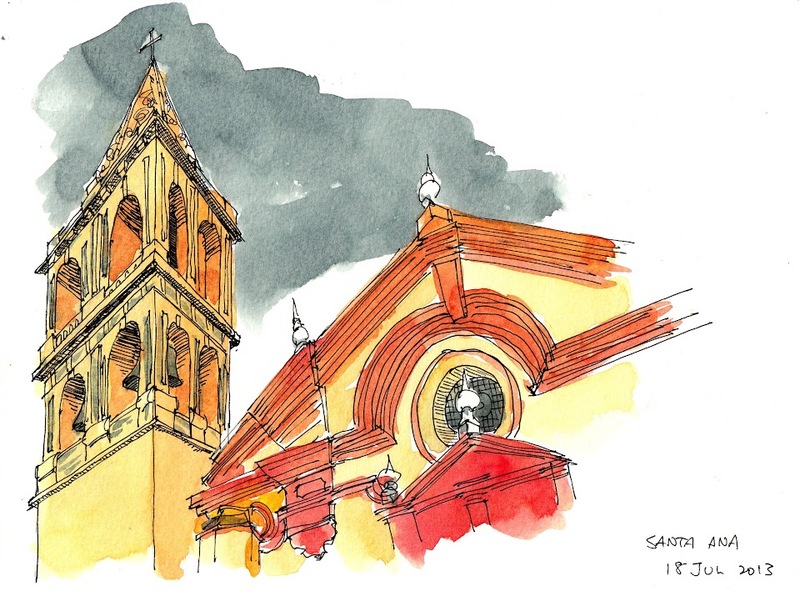 We met up with Seville sketchers at the Santa Ana church. Another sketch of a tall building from close proximity. Neck pain follows. Cathedral Giralda of Seville. Yet another complex building to draw. I'm particularly drawn to the statue of the Giraldillo on the right. 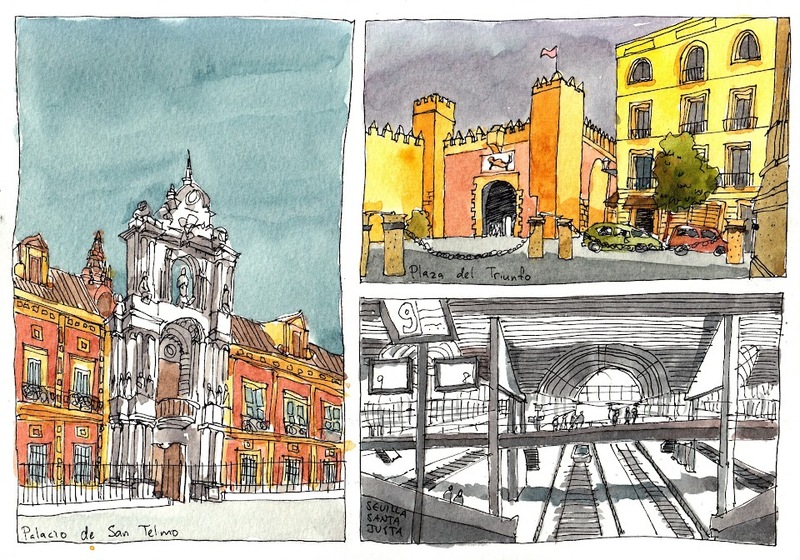 I only spent two days in Seville and there are just too many places to draw. I had to draw small to draw more and even that I could only draw three places. These two are from Madrid. The bottom piece is from the my hotel view which is Lapepa Chic B&B at Madrid city centre. Plaza de Toros in Seville. That's the oldest bullring in Spain. It's quite striking with the choice of orange, deep magenta for paint colours against white. 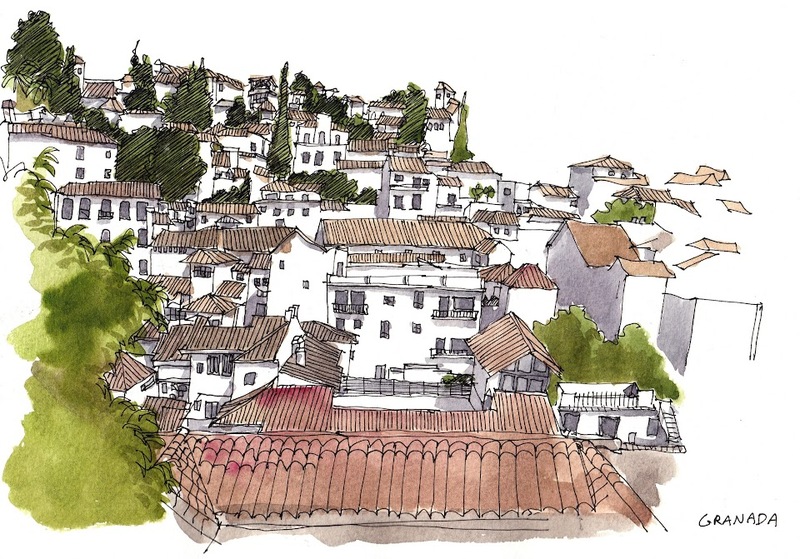 Another cityscape, this one is of Madrid, drawn from the top of El Corte Ingles with the company of Madrid sketchers. This piece took 3 slow hours. It's nearing the end of the trip now. There's always space for a sketch at the airport. This is the Madrid Barajas Airport. I took Qatar Airways. The plane tickets are not too expensive, food is decent and entertainment (shows) on the plane are plentiful. Scan of the some tickets bought for planes, museum, a flamenco show, and a EUR 20 sim card from Orange good for 1GB data. 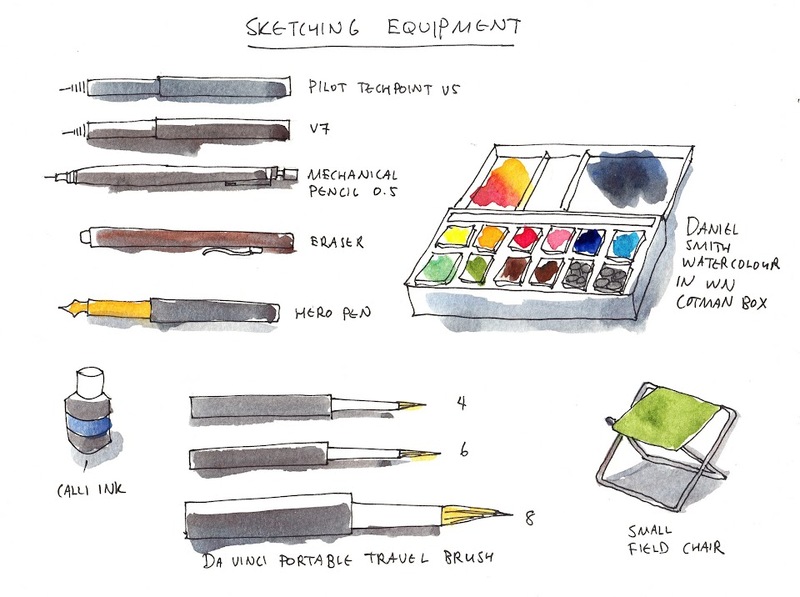 These are the drawing equipment I brought. I forgot to draw in the waterbrush, which I didn't use much anyway — I hate mixing colours with that. My favourites are the Pilot Techpoints. By the end of the trip, they were almost empty. I panicked a bit because I can't refill them without a plier. The mechanical pencil was on its last pencil lead. The eraser was left with a small bit. Now I'll know to bring more for long trips. I didn't use much of the Hero pen because it's a hassle to refill, relatively speaking. The watercolours I used are Daniel Smith tube paints squeezed into a Winsor Newton Cotman box. I decided to bring a lighter plastic box instead of the usual metal one as I've no other spare empty boxes left. Da Vinci travel waterbrushes are great. I lost my beloved field chair and had to buy a wooden one to replace it. I can't remember where I put it, It shall forever be missed. All these sketches were drawn on the A4 watercolour Moleskine Album. It's horizontal format and has 60 pages. I planned to draw at least 5 pages a day and managed to fill the whole book, thankfully. Scanning the A4 Moleskine is not easy. I also brought along the hand-book for smaller sketches. This trip is absolutly beautifull... 10000 better than pictured with camera. You remember me the old days when we where young artists usted to draw at hand... I wish I can recover that times... Thanks for sharing it! I Had my lesson for today..... From you. Love your art!!!!! Sure, you can use the image. Thanks for the feature.